Extensive experience of working with teachers of young children who include project work in their curriculum confirms my assumption that the quality of the learning that a project yields is strongly related to the topic under investigation. I suggest that it is useful to make a distinction between accepting the topic that children appear to be interested in versus promoting that interest. 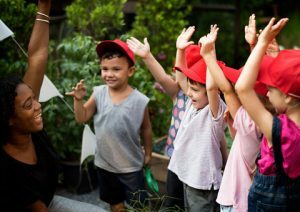 If the children want to share their ideas and feelings about Ben 10 or dinosaurs or Spider Man, then teachers can provide opportunities for conversations and exchanges of feelings about these interests, perhaps during group time or at lunch time or during a chat on the playground. Occasionally, teachers can invite the children to draw, paint, or act out their ideas related to the characters of interest and let the children’s fascination with these elements subside. Exploring those ideas should be one of many other possibilities during play time or outdoor activity times. However, one of the many values of the Project Approach for young children is that it involves teachers in educating children’s interests—alerting them to actual elements in their own real environments that are worth learning about, that are worth understanding more deeply and accurately, and that help them appreciate how many others contribute to their well-being. The online journal Early Childhood Research & Practice, the Illinois Projects in Practice site, and the Project Approach site include reports of many projects in which young children conduct investigations of a wide variety of real phenomena within their own experiences that can begin the building of a lifelong disposition to appreciate and deepen their understanding and awareness of significant aspects of their own experiences, their communities, and the larger real world.